Back in February, we had shared the news of Tata Docomo offering all Local & STD On-net calls at 1 paise/6 seconds on a special recharge of Rs. 24 valid for 30 days without any fair usage policy. We have some bad news for those who use this pack extensively to call their dear ones across the country as Tata Docomo has applied a FUP of 500 minutes for calls made to Tata numbers on RC 24. 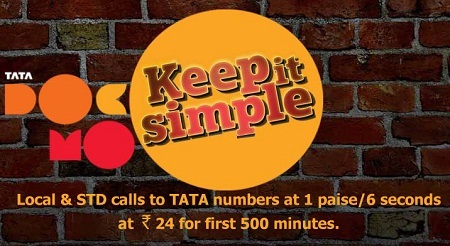 Beyond 500 minutes, all Tata calls will be charged at 1 paise/second. All Local & STD calls to Tata network (GSM & CDMA excluding fixed line Walky) charged at 1 paise/6 seconds for first 500 minutes. Tariff of 1 paise/second applicable after the successful usage of 500 minutes. Tariff validity of 30 days. Tata Docomo recently made some changes in their internet packs as they reduced the validity of Rs. 48 pack to 21 days and started offering 4 GB data instead of 6 GB in Rs. 95. Data price hike and now the FUP on RC 24 makes us believe that some serious price hike is lined up on other services as well in future. Lets hope they keep it simple and cheap to stay on top of the heavily crowded Telecom market.